Marketers today use multiple marketing channels that generate impression-level data that can be linked to unique individual, or household, customers. While most of these channels are digital, some are not, such as direct mail, call-center records or catalog mailings. A more appropriate and widely-accepted term is “addressable”. 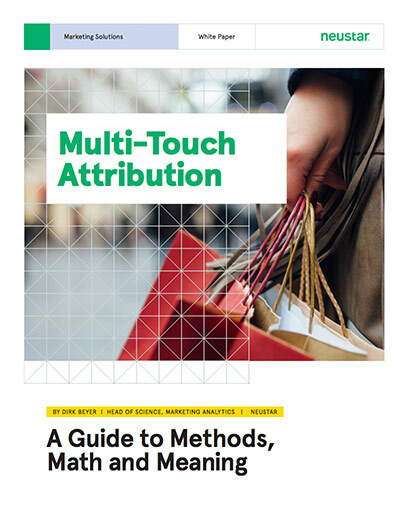 Done right, multi-touch attribution is more than just a scheme to give credit to the addressable channels that precede a conversion (such as a purchase, request for information, or sign-up). It’s a way to assess performance, measure return on investment and, ultimately, guide marketing budget allocations to the most effective channels. The ultimate goal of marketing is to change consumer behavior. Thus, the true measure of marketing effectiveness is not how likely a customer is to buy, but whether and by how much marketing increases a customer’s likelihood to buy. For that reason, any method used for multi-touch attribution must be based on estimates of incremental effects. In addition, the incremental effects must express causality, not just correlation. In this world of targeting, customers are typically exposed to marketing because they are already considered more likely to make a purchase. But that doesn’t necessarily mean the marketing is precipitating a change in behavior. Similarly, executing a search or clicking on a display ad is a strong indicator of purchase intent, but that doesn’t mean the customer is influenced by the display ad or the landing page. What Makes Multi-Touch Attribution Viable? Many attribution methods are based on pre-determined weights that are used to proportionately assign attribution to the marketing treatments preceding an outcome. Clearly, simple weight-based allocations like first- or last-click, equal attribution or time-dependent weights do not get to true incrementality. INCREMENTALITY: You should first understand that marketing is not responsible for the entire purchase. Each customer has an innate propensity to purchase without any exposure to marketing. It is the change in propensity that matters and must be measured. HETEROGENEITY BETWEEN CUSTOMERS: Each customer has a different base propensity to purchase. Customers are exposed (or not exposed) to different marketing tactics based on their unique propensity to purchase, which accounts for differences in conversion rates. These differences must be separated from the actual persuasive effect of marketing. EXTERNAL EFFECTS: Base conversion probabilities change over time, often rapidly, if the customer environment changes. These non-addressable factors such as the economy, price, competitive behavior, weather and, of course, non-addressable advertising are often correlated with online marketing and, if not taken into account, will bias results. DATA VISIBILITY BIASES: Often, a customer action or impression is required for the customer to enter the universe of people that leave a trace in the data files. The makeup of the observed population changes, depending on what kind of marketing is executed. While a well targeted display campaign might add many high-propensity customers to the dataset, an indiscriminate campaign or cheap affiliate traffic could yield a high number of non-converting leads. As a result, the average conversion probability of the targeted population will vary. To account for all of the above factors, Neustar uses an automated model-based approach to multi-touch attribution. This relies on a flexible, proprietary model creation platform that generates faster, more relevant and more accurate insights and recommendations. Historical transaction data, customer attribute data, and offline, market-level data is joined into customer histories. Model features that describe the customer, the environment and the received marketing exposures are extracted from the data. The model is calibrated by statistical estimation of the response parameters. For each customer, the model is used to score the customer’s history, to assess the incremental effect of each marketing exposure on conversion probability. Conversion metrics (e.g. revenue) are attributed to marketing exposures based on their incremental impact on conversion probability. The first sum captures differences in individual customers due to their distinct attributes. These attributes can be demographic or summaries of past interaction behavior. The second sum captures the influences of variables that are collected at the market level. These variables are aggregated into market-level conduit variables M_i that depend on market-level driversX_m. These conduit variables are derived from market-level models. The third sum captures multi-touch attribution variables derived from the customer’s interaction history. These variables capture recency (or the effect of time since last marketing impression) and frequency (the effects of multiple impressions of the same type on an individual customer) for different types of marketing treatments and their interactions. By estimating and scoring these models, we obtain a complete database of impression-level contributions that can be summarized and compared along any dimension of the dataset. These contributions are a true reflection of the lift caused by marketing and when combined with impression-level cost, can provide marketing’s real ROI. Why Use Customer Response Models? Assessing advertising efficiency, at its core, is an exercise in marketing science and quantitative customer psychology more than an exercise in computer science. Central to Neustar’s approach is a customer response model that predicts the probability of each individual customer to convert as a function of the customer’s demographic, psychographic and behavioral attributes, as well as the customer’s history of received (or self-initiated) marketing exposure. They are based on well-understood theories of customer behavior. These theories—including concepts like recency, frequency or saturation of advertising, and interaction effects—can be expressed in intuitive ways and have been used in marketing science for decades. They account for non-addressable influencers of customer behavior by incorporating population-level data, along with using customer-level data. They provide insights at the customer level that can be used for multi-touch attribution and other marketing applications. Examples of such models include Targeting applications, Lifetime Value models and Next-Best-Action applications. Variables that are often outside the addressable dataset affect customer propensity to convert. Ignoring such non-addressable variables results in a less accurate multi-touch attribution model, often inflating the effect that digital marketing has on sales. Thus, it’s essential that your multi-touch attribution solution includes these non-addressable variables, as well as a logical way to incorporate this information into the model. Depending on data availability and level of detail required, we build anywhere from simple to highly sophisticated aggregate market response models that feed into our multi-touch attribution models. These models contain all relevant drivers of conversion, including seasonality, price, competitive activity, economy, weather, off-line advertising, and on-line advertising as appropriate. We incorporate this data in aggregate time series form and use it to assess the incremental effects of offline variables on conversions over time. With aggregate-level models, the problem becomes how to use them in attribution. If all the variables affect individual customer propensity to convert, they ought to be part of the individual customer response model. A naïve application of an incrementality percentage derived from market-level models indiscriminately to all customer histories—what we call the “haircut method” — will bias attribution substantially. In these methodologies, highly effective digital marketing treatments will be penalized while ineffective ones will be favored. As a result, differentiation will be dampened and reallocation opportunities might be squandered. Our approach uses aggregate-level models to establish the relative impact of different variables in each time period and to summarize these impacts in a manageable number of “conduit variables” that channel the offline effects into the customer-level dataset for estimation. As a result, online effects are estimated in the presence of offline effects but the relative effects of offline variables are controlled. This produces a consistent, unbiased and rich customer-level model that has all offline variables present for analysis. Our approach uses aggregate-level models to establish the relative impact of different variables in each time period and to summarize these impacts in a manageable number of “conduit variables” that channel the offline effects into the customer-level dataset for estimation.